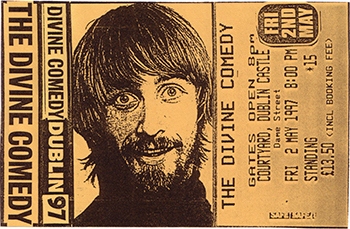 Among the number of Divine Comedy live recordings I have gathered over the years, this little Dublin show has always had a special place in my heart... This is a live recording I’d recommend to anyone who wants to start listening to Divine Comedy live shows. In 2010, I decided to properly digitize my whole tape collection using high-end equipment. Having just bought a 24 bits digital recorder, I bought a Nakamichi DR-1 tape deck, and used audio editing software with oscilloscope and spectrogram to monitor the recording... Unfortunately with that tape, I didn’t had as much improvement as usual, since the tape itself was poor. You can still note a minor switch of quality at 1:18 on the sample. In conclusion, while tape processing seems to be an endless process, it is not necessarily... When we get the chance to find a copy of a master recording, except if it is damaged, there would probably be no reason to reprocess it again if we do it well... While I’m quite satisfied of my latest edit of that show, I’d of course be happy to work again on a new version if I happen to find a better or a master copy of the recording... But of course, I’d find more exiting if I could gather new material from that era.... For example, audience tapes of the Flux Festival ’97 with Michael Nyman do exist, and have never been properly digitized yet... So don’t hesitate to get in touch if you have any old tapes in your collection.